Once upon a time I was 13 years old and had a big adventure. 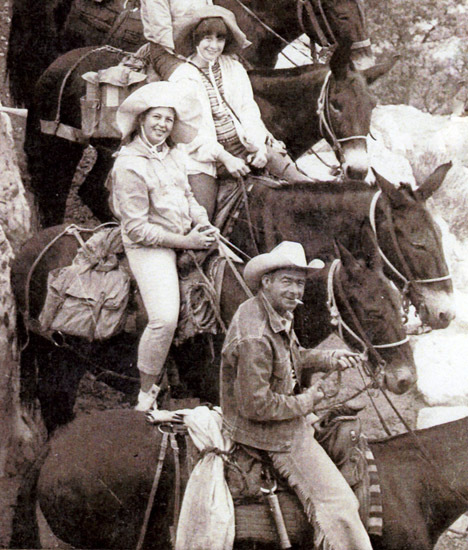 My adoptive parents took my best friend Anita Danforth and I to the Grand Canyon, where we rode mules down the Bright Angel trail to Havasupai. That's me up front, right behind the Marlboro Man wrangler, and Anita direcly behind me, in the silly matching home-made hats we wore. Ah, youth. Now 40 years later I have my OWN mule. And what a mule he is! 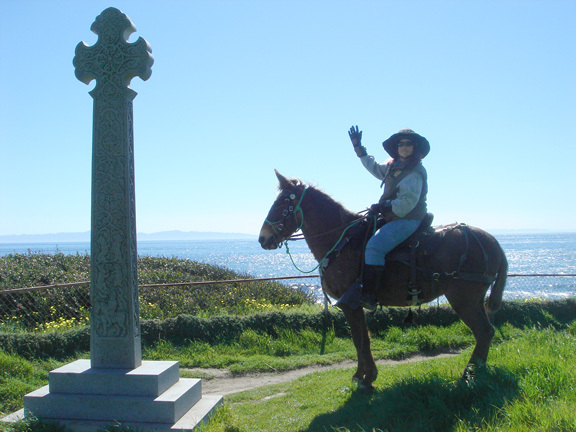 Here we are posing by a Celtic cross just north of my alma mater the University of California at Santa Barbara. We frequently ride on the beach and on chapparal trails in the coastal plain just north of the campus. A few years back I had my semi-century birthday, and the inspiration descended upon me that the one thing that I had always yearned for and never gotten was a horse. EVERY girl wants a pony! So I decided to be utterly self-indulgent, in the "IF NOT NOW WHEN?" mood, and buy myself one! Being a greenhorn with little equine brain, NOT REALIZING YET that I was destined for a mule, I ended up with an amiable old Amish draft horse. But, after a year with OttO I had to face it: he wanted to walk on flat land, and truth be told, he would prefer semi-retirement! So I sold him to The Alisal Ranch where he now takes guests for rides on gentle trails. 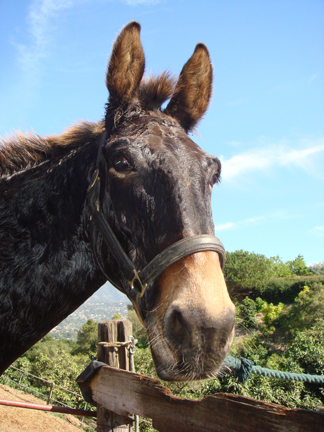 There are a million reasons why a mule is vastly superior to a mere horse. If you come and get a tattoo from me, just get me started and you'll learn more about mules than you knew you wanted to! But for now, let this page serve as a brief introduction to my marvelous creature. I did some research and decided that I wanted a gaited mule, the smoothest of equines, and since this is a comparatively rare animal I flew to Murray, Kentucky, to the Jody Kelso Select Mule Sale. More than a dozen gaited mules were offered at the auction, among the 120 mules of all sizes and shapes. Bill Barnett came late to the show, so it wasn't until I'd looked at a lot of other mules that I saw The One. There he was, in a stall at the sale, and it was love at first glimpse. I didn't even see until AFTER I had purchased him that on his hip is a brand of a fish symbol. How meant to be is THAT! I admit I was smitten by his chocolate dappled color, a heritage from his mother Sandy's Fancy Candy, a registered Rocky Mountain Mare. He is the preferred color that the Rocky breed is known for. But he has the brains and stamina of his father, a mammoth jack donkey named Stamper's Tyler, and is the superior possessor of hybrid vigor, the best parts of both. He's much smarter than any dog I have known, and in his own unique way he is teaching me how to ride him. Which is to say I tell him where I want us to go and then we either agree or we don't. I often get a sense that he is laughing at me, when he tests me to see if I am paying attention out on the trail. Sometimes I'll successfully maneuver us through a trail obstacle and be feeling quite the equestrienne...and he'll throw a glance over his shoulder that reminds me not to take too much credit for the success of our partnership. It is easy to anthropomorphize an animal that obviously gets the joke! Vital in guiding my learning and developing skill as a rider, I have been remarkably fortunate to meet and study with Jerry Tindell. I first saw him at Bishop Mule Days the largest celebration of mules in the world, an annual mecca for all mule enthusiasts. His clinic there was so inspiring, making obvious connections and explaining the principles of human/mule communication, that I realized for the first time that there is a vocabulary of gesture and movement that is key to the centaur bonding I was looking to achieve. So now I continue to study with Jerry, at clinics or in private lessons, and I take a measure of pride in my accomplishments. I've gone from someone who was a passenger on an equine to one who is progressing constantly into being a true rider. I ride in the front country in the mountains of Santa Barbara County with friends, and tackle larger adventures with the BackCountry HorseMen and other organizations that do long distance endurance rides. So for the curious, this partially answers the question about what I do when I am not tattooing! If you are still curious about my adventures with Tobe, I have a LuckyTrails Blog where maps and photos from our recent excursions are posted. HAPPY TRAILS! - MULE UP ! ! ! This photo of Tobe and I is featured in the "BLESSED ARE THESE HANDS" book.